Just to share out a light weigh Linux based OS to all miner here. AMD GPU can use but lag of Overclock function. Currently XMOS only support ETH mining client. using "ethminer" from github that been optimal for Nvidia GPU. I am using Linux 16.04 LTS USB Image create by "Cyclenerd" from github. TQ Cyclenerd for the Great work. here the link on github. After using for few week, I did some "Bash Scripts" to tweak the Mining processor to be more smart and hope to get more share from POOL. 1. Plug and Play, for all Nvidia GPU. 2. Only need to change setting on 1 Config files, then everything is running. Simple and easy. 8. Easy understand Log file for easy troubleshooting. 9. And the most important thing, it was FREE. Can download direct from google drive or torrent. Tools to write bootable image to USB. Tools to write bootable image to HDD. 1. Download the Image and Tools you need. 2. Unnzip the image using 7z. 3. Write the Image to any > 8GB USB Drive or HDD/SSD. 4. Plug the USB Drive to your Mining Ring, and power on it. 4. and last your Nvidia OC setting. 5. Control X to save and quit the nano editor. xmosconf All Your Mining Setting need to Set inside here. Type Command mine to lunch Mining console. There are total 4 screen inside the mining console. If you are haapy with the OS, please buy my some tea.. TQ very Much..
1. Wifi Support -( Done) But only with WPA and WPA2 security. 4. AMD Overclock and Under-clock -(Pending) Still finding the way to under Voltage it. But it running fine with direct Bios Mod. Other what your all request...? 3. Can Mix AMD and Nvidia GPU together. 5. Plug and Mine on most of the system. 2. Put in your wifi AP Name and Password. 3. Restart the system, it should work. Report Hash Rate to pool..
COMMFLAG="--farm-recheck 2000 -SC 2 -RH"
Thank you for this contribution to the mining community : there is no such tools for NVidia GPUs users :-). 1 - Are the sources available ? 2 - Is there any fee ? Thank you for give me a change, hope every one like this OS. 1. For source code I will open up github soon. 2. No fee, totally free. 3. For Nvidia OC I am using Nvidia-Setting and Nvidia-smi. They was a 3 type OC setting inside XMOS. NV_OC="1" Present Overclock setting. It will -100 to core and +500 to memory. NV_OC="2" same OC setting apply to all GPU install on the system. You just need to put OC value on the conf files. That all. You are set +1000 to GPU memory. If you can get +500 stable on MSI afterburner, on Linux it was x 2 (1000). I can accept any recommendations, and make the OS more user friendly. i will definitely try this tomorow. here is my first test. after booting normally and showing a login prompt, it goes to blank screen but i can remote it with putty. Tq for give me a try. If you connect keyboard mouse and monitor on the mining rings, You need to press Control + Alt + F1 to enable the display. XMOS is design for simple and easy use. It was no need keyboard mouse monitor to connect when mining. Using putty is more easy and save cost. U also can connect to the xmos using any web browser. 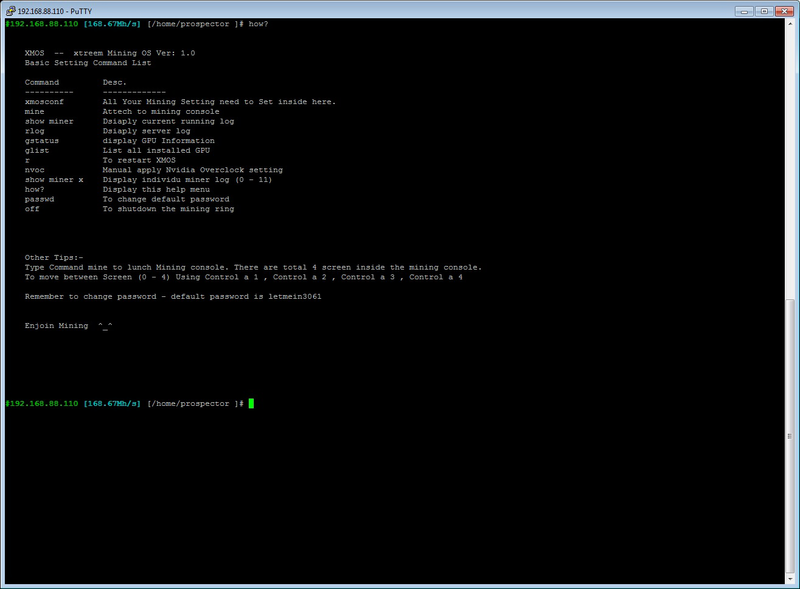 It will call out the webase ssh as well, u can do port forward on router to that port. Inside the mining console, you can use Control + a + 1 ( or 2 or 3 or ... ) to select screen. Try OC the memory to 4000MHz, most of the DDR 5 memory can stable at that speed. And under voltage your card. Please try out the best future about xmos. Auto restart ethminer when no job for 5 min. Running individual insane for each GPU. Please do let me know what other thing that and improve the xmos. i will try to OC more on my real rig. this one is on my personal computer. its 1070 katana that has a single slot design. i cant oc too much. ill send more ss on my mining rig. my second attemp of XMOS experiment today is to play with the OC. it turn that OC clock speed is raising slowly. 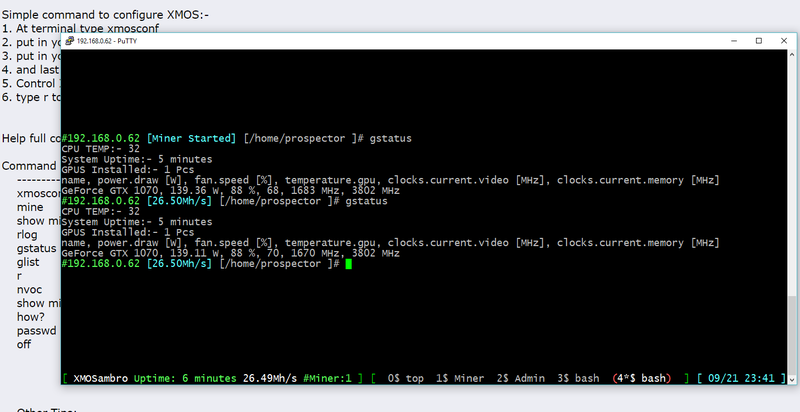 at the first 3-5 minutes of mining, the speed is still at stock speed. after 10 min it reach the peak but sometimes drift to lower speed a little bit. maybe the system got a little hot i guess. tried with single gtx1050ti OC version. drawing 105W from wall. is there any monitoring software (client). i need to be alerted when a miner is off or the rig is hang so i can check it immediately. sound alarm on a monitoring client is the best notif in my scenario. plus an email notif it will be perfect. one question about this OS, how can i restart the miner only, without reboot the whole system? 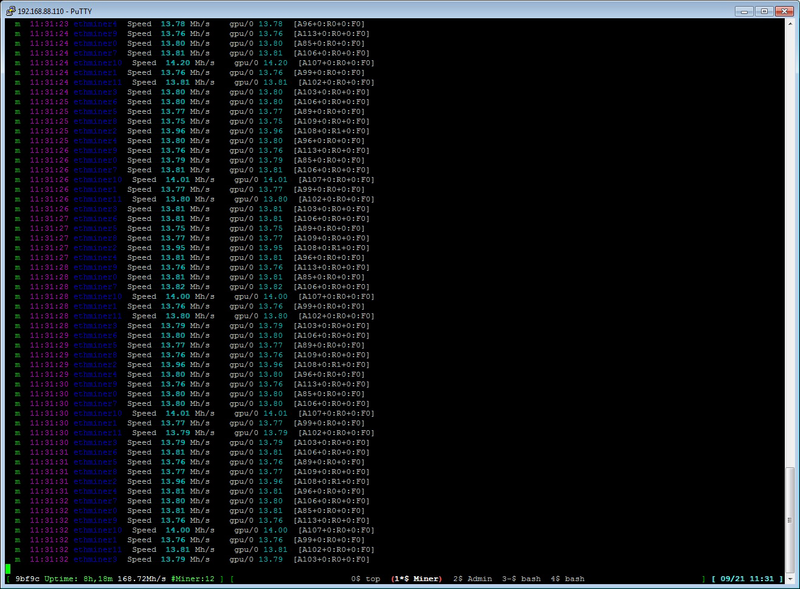 i need to restart the miner after change the conf. third experiment is to run 6-12 gpus in a single rig. Here the answer for ur question. 1. The system will auto apply the Overclock setting, 5 min after the system boot up. 2. For system monitor and alert system still on development. But currently the system won't hang. Because:- 1. When any GPU hang, the system will auto reboot. (Hard reboot). 2. If miner hang (No job for 5 min), it will kill the miner and start it agian. Base on which GPU you want to close the miner. Each GPU running on it own miner. Happy mining.. TQ for try my OS. I just wanted to say thank you.. I was using Cyclenerd's miner (he did a great job with this) for about a month.. I'm happy your were able fork it. Again, thanks for the features.. I hope to test out the AMD cards soon. Here's a screen of the miners..
Hope you will like the OS. Current version of XMOS also can also mine with AMD GPU, AMDpro drive 17.30 already installed, but don't have overclock funtion. All watchdog function was running fine. For AMD GPU, Currently I am using Polarisbios edition to put all the stable setting in, and flash it to the AMD card. It will run direct to that setting, no need to overclock with software any more. Tested on RX470 with core 1250, and memory 2100, it running on 97watt stable with 27MHs. This looks nice. I will try it tonight on my test rig. 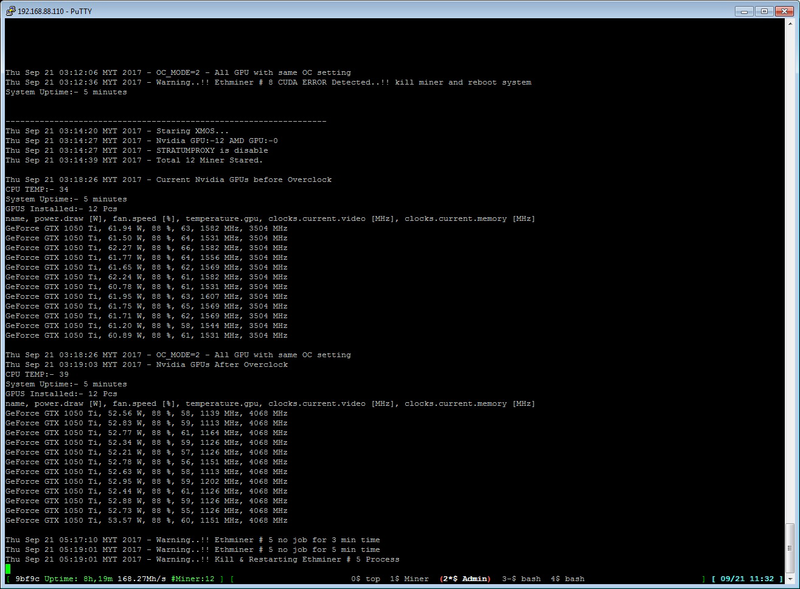 I am now using nvOC, but at this moment I am mining mostly Ethash and this XMOS looks very light weight. Are there any plans to make an AMD supported version with overclock and undervolt options? I could see running something like this on a pi at the end of an isle of rigs or something.Might want to change the theme a bit but still pretty good. Thank You for give me a try. Hope you will like the watchdog function and "un-died" future on XMOS. for AMD GPU overclock and under-volt support will be include in next release. Still no race is there in which XMOS faced defeat. You want to use a pi to control multiple of miner? I think it can be done.. Need your clarification before trying. I have rx470 rig which overclocked using bios editor, etc under windows. Before using xmos, do i have to restore the overclock into default? What about that setting 1250 and 2100, will it be ok on my gpu? I haven't tried to use that timing before, have no idea whether my gpus are capable at that. One more thing, will it be oke to use mix gpu rig, amd and nvidia? Afaik, ethminer is not working on my mix gpu using -X option, but cmiiw. I like this software, but I think it will need some small improvements. It's very easy to setup and is booting super fast. - Is it possible to make an option in the config to auto enable the screen after booting (instead of control + alt + F1)? - Is there a way to change/set the resolution for the attached screen? - How do I change the farm-recheck? Maybe it's an idea to add an advance mode in the config for the more experienced users. - How do I change the overclock delay time? When everything is stable it can directly start after booting. I'd like to see this as an option in the config file too. - How do I change/overwrite the Ethminer version? I'd like to do some tests with Ethminer 0.12.0rc1.